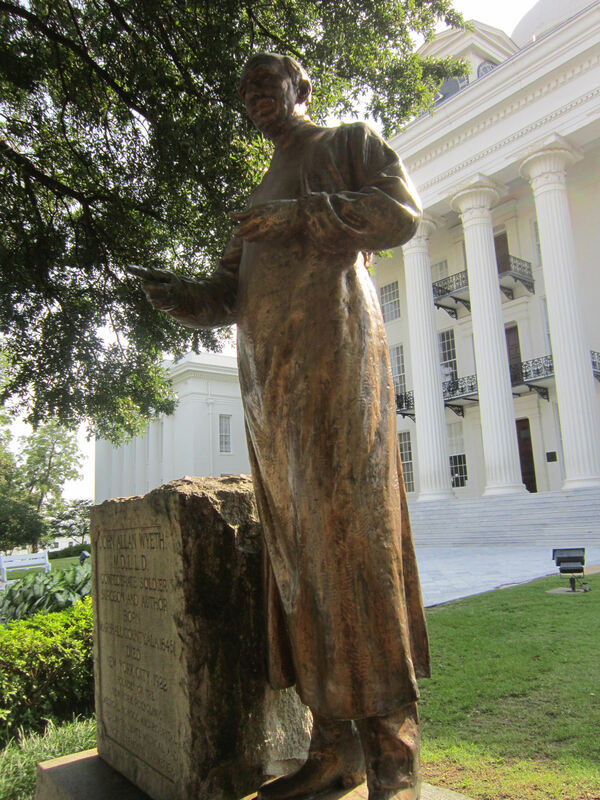 2015 Road Trip Photos #42: Walking, Not Marching, to the Alabama State Capitol « Midlife Crisis Crossover! Lister Hill was a WWI veteran and a 45-year Congressman whose works favored medical progress and expanding modern amenities into rural areas, but didn’t exactly have a favorable civil rights record. Anne and I decided to structure the morning of Day Six pretty much the same as we had the morning of Day Two. 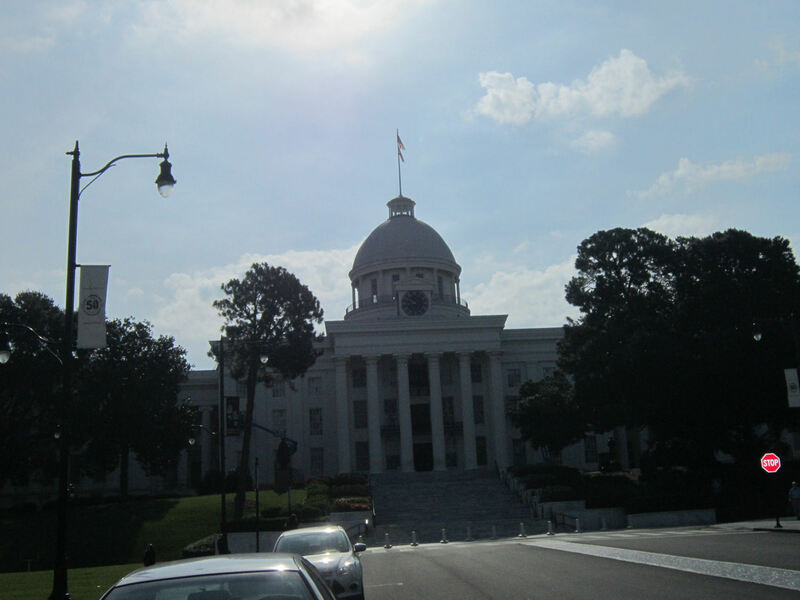 Whereas the latter was spent walking around downtown Birmingham, this time we’d try doing the same with the state capital of Montgomery. One major Alabama city kind of looked like the other on our maps, so we expected a simple, breezy morning of walking from the hotel to the Alabama State Capitol. We erred in failing to account for scale and structure. 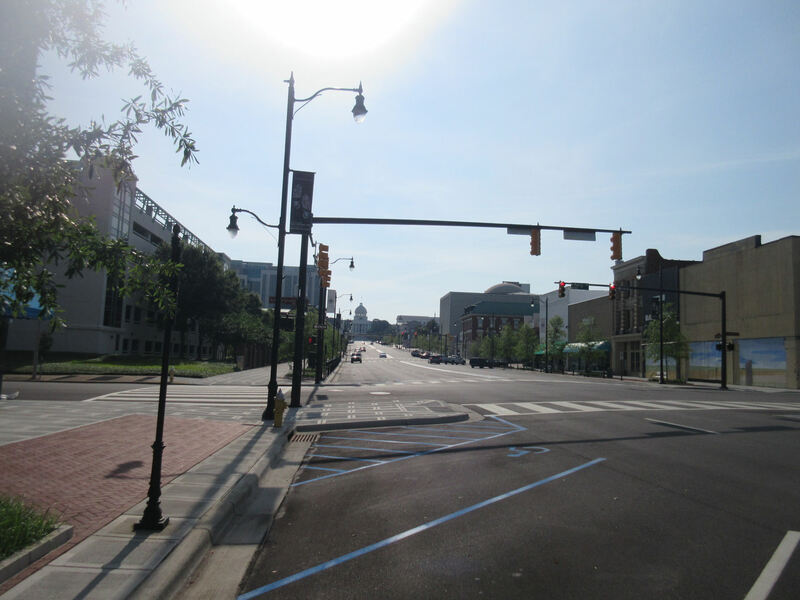 If only we’d known that Montgomery’s city blocks are five times as large as Birmingham’s, and if only we’d known Montgomery somehow abolished all forms of cool, relaxing shade from within city limits, we might’ve taken a different exploratory approach. Say, driving around the city instead of walking its miles and nearly killing ourselves. Advantage: Birmingham. Large white government buildings outnumber genuine shade trees 10-to-1. The big wispy sticks in this pic don’t count. After a few blocks of walking east from our hotel, that’s how far we still had to go. Besides the aforementioned civil rights sites and tributes, other places and things dotted the path along the way. Not many people, though. Even though this was around 10-11 a.m. on a Wednesday, people and cars were few and far between. 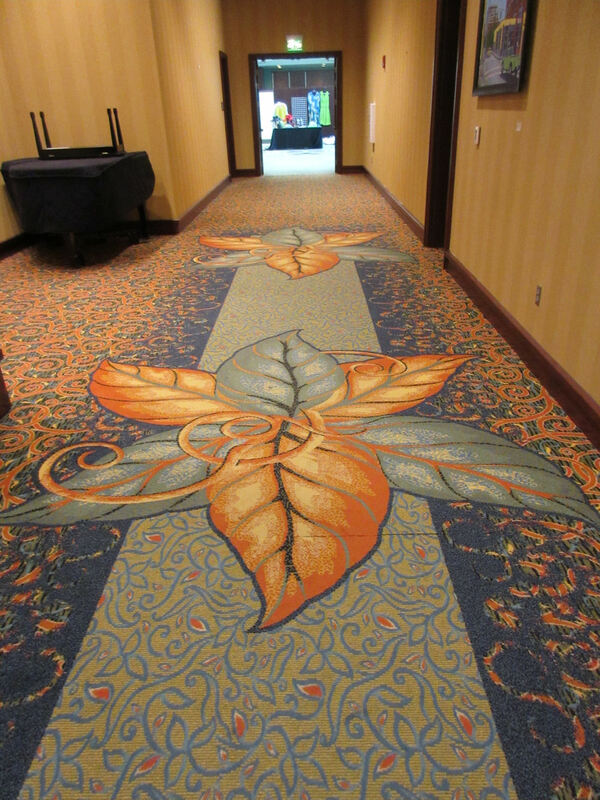 If we’d known, we would’ve retreated to the hotel, fetched the rental car, and driven from spot to spot with all the parking we wanted. But no, we were stubborn and we trudged on with our bottled waters and our fervent, nearly feverish hopes that we wouldn’t die on the sidewalk. 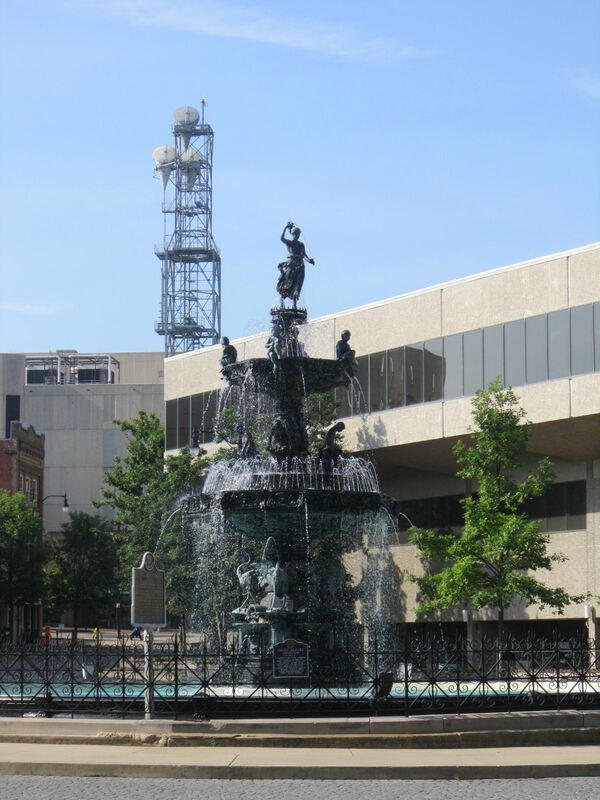 The Court Square Fountain has been around since 1885, though its Greek-god statues — including Hebe on top — were replaced with sturdier usurpers in the ’80s. Back in the day, right around here was the hub of the Montgomery slave trade. 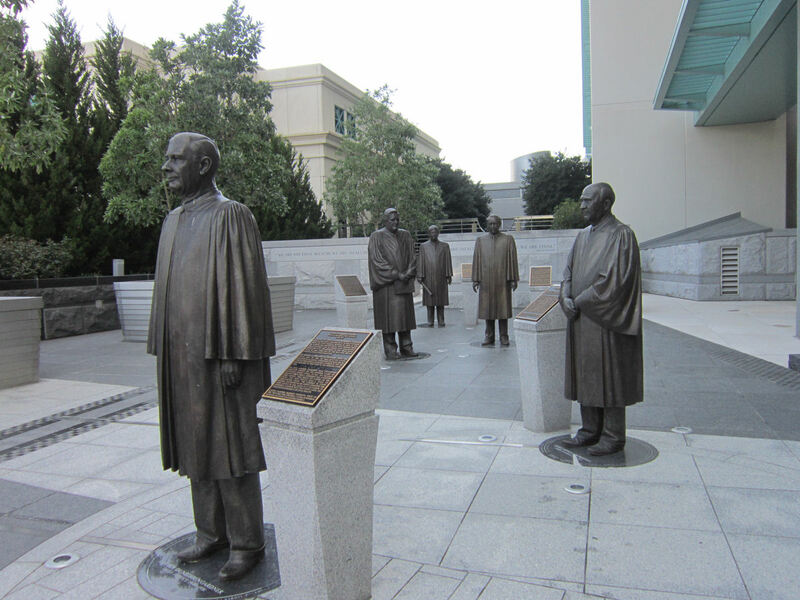 Statues of past Chief Justices of the Supreme Court of Alabama. Leading the pack at far left is Chief Lucien Dunbidden Gardner, who presided 1940-1951. 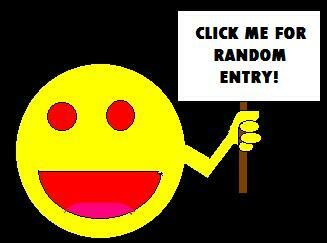 If anything noteworthy occurred in that time frame, heck if I could find it. Rock erected in 1976 courtesy of the local Scottish Rite Freemasons to commemorate the Bicentennial starring President George Washington, Freemason. 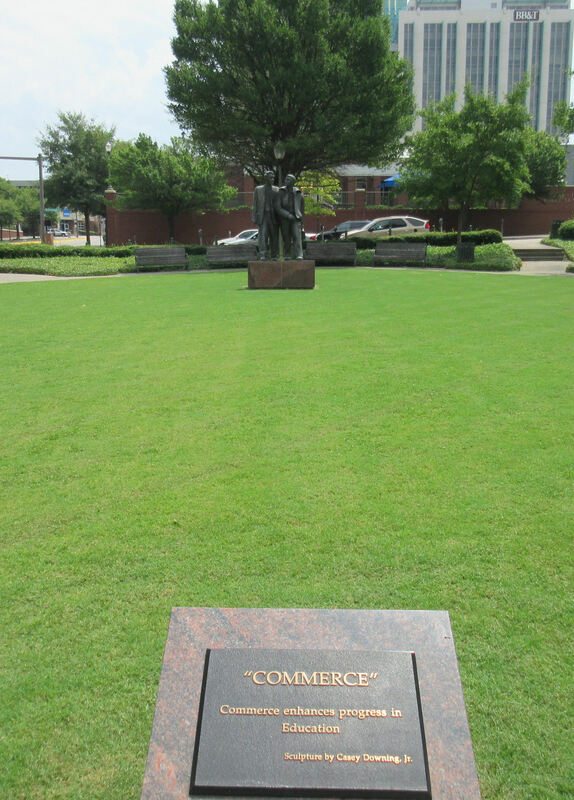 Grassy lawn starring a sculpture called “Commerce”. Dozens of degrees later…there we were. 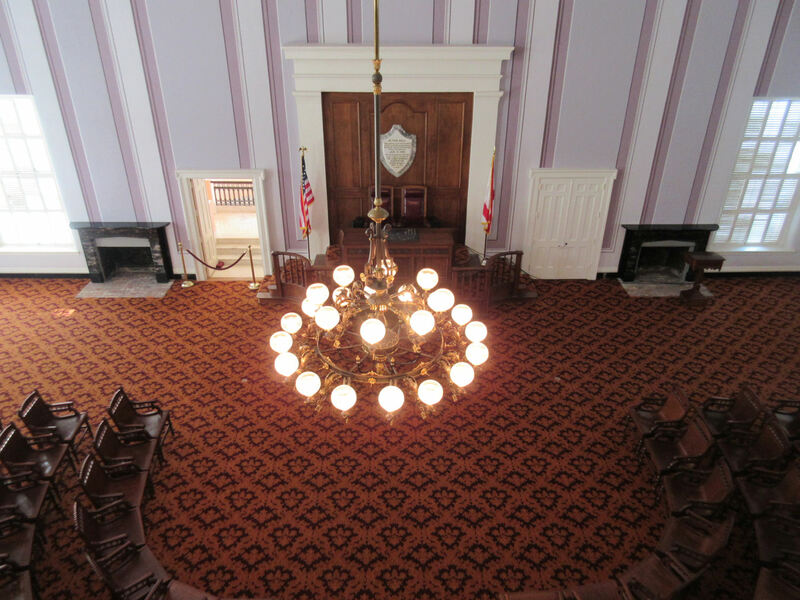 The Alabama State Capitol. Another addition to our collection of capitol domes. Someone remind me to post a compilation sometime. 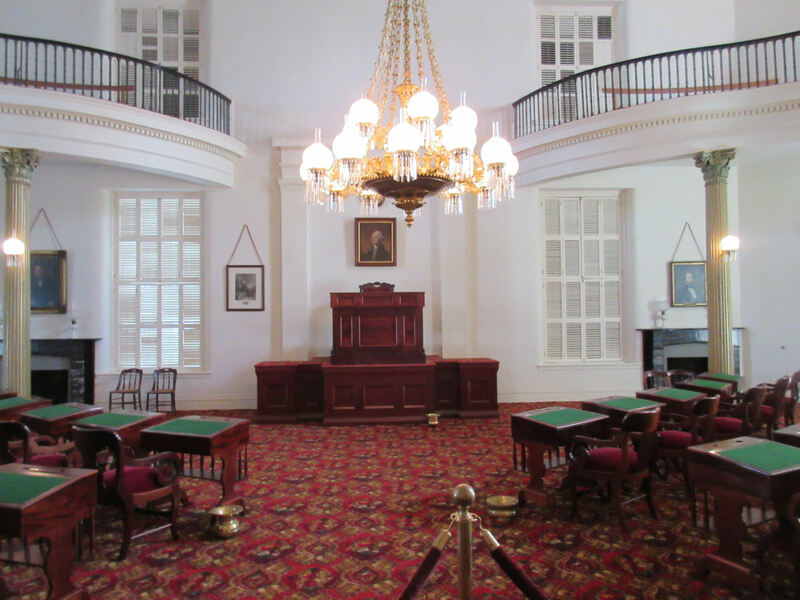 The old Senate Chamber has been meticulously restored to its classic 1861 appearance, complete with oil-burning chandelier replica. The old House Chamber’s simulated decor dates circa 1869-1870. Today both halves of the State Congress convene in one of the other large white buildings downtown. 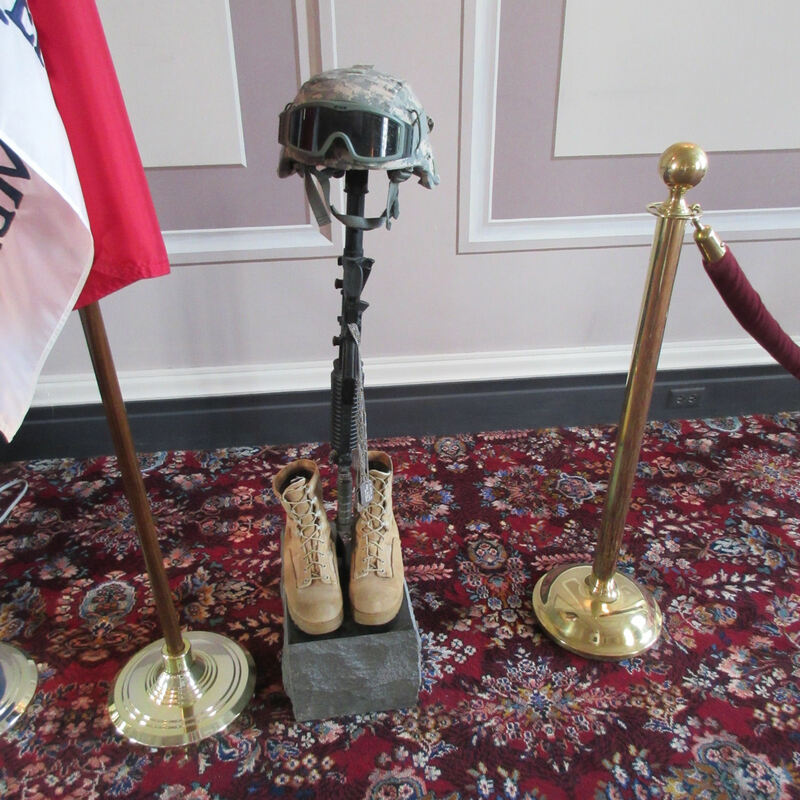 Modest soldier memorial. Details missed. 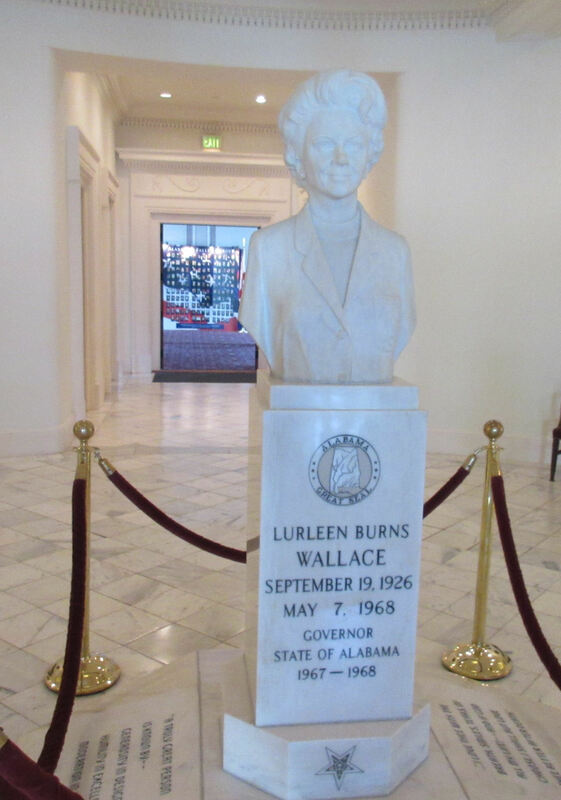 Lurleen Burns Wallace, the only female governor in Alabama history to date, served after her husband George Wallace’s term ended. 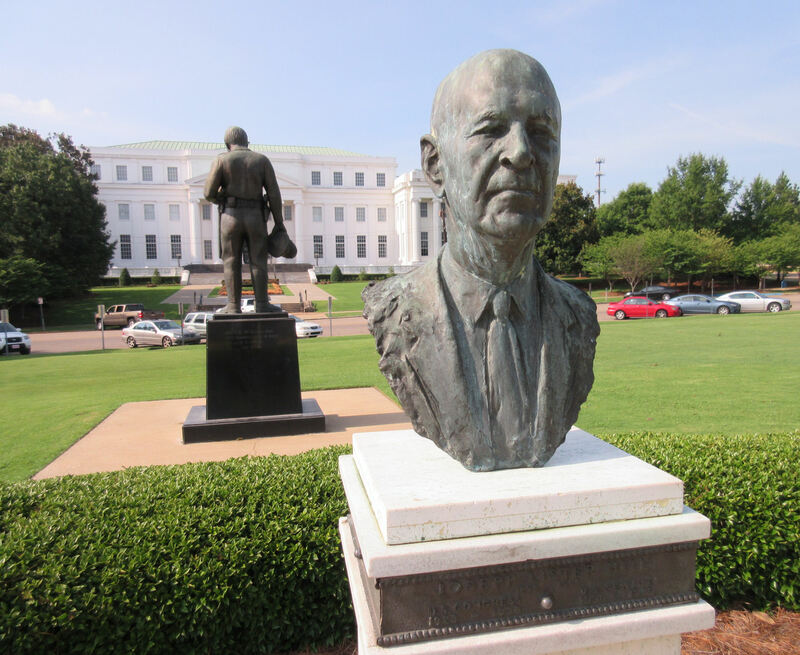 Alabama’s Constitution forbade George from serving consecutive terms, so having his wife run and win after/for him was the next best solution. I can’t even begin to sum up all the drama. 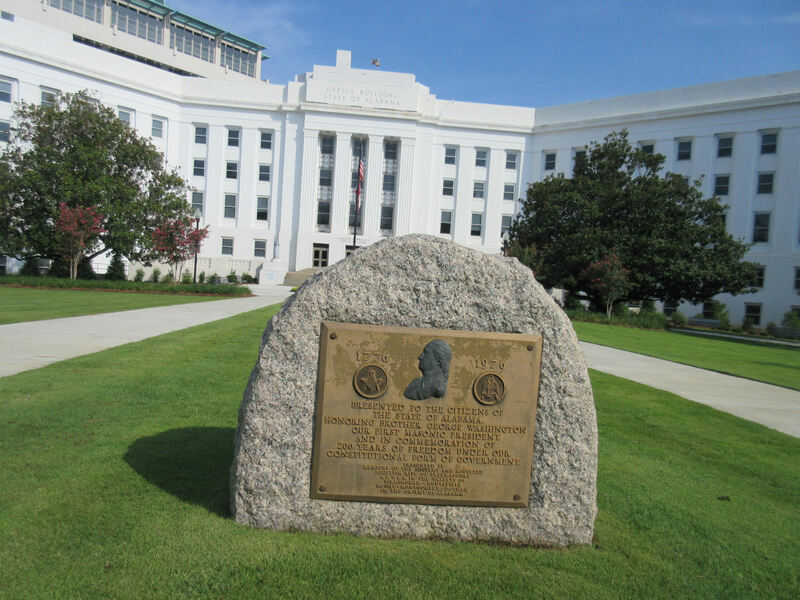 One of many statues on the Capitol grounds remembers John Allan Wyeth, who served as a Confederate cavalryman until his capture in 1863 at age 18. He served two years in an Indianapolis prison, later became a surgeon. and after the turn of the century was once president of the American Medical Association. During our research, Anne thought she’d seen a website reference a statue of Martin Luther King somewhere inside the Capitol, complete with photo. We searched all the public areas (we think) but saw no sign of it. We asked a docent, who was very polite and accommodating and tried for a long 10-15 minutes to check with his people, call around, and see if there was anything to this alleged King sighting on state grounds. We would’ve been ready to drop it after about the first minute, but he was really, really, really persistent in his attempt at customer courtesy. Alas, no such statue was to be found. Perhaps it had been moved. Or had never existed. Or had been taken off display because it clashed thematically with numerous other items we found all over the place, inside and out. More about those next time. To be continued!